Stunning fjords ringed by snowcapped mountains. Deep blue waters reflecting the spires of medieval towns. Vast herds of reindeer crossing the high Arctic, celebrated in story and song by the Sami people. And with luck, the night sky draped in a shimmering curtain of green, blue, red and purple – the elusive aurora borealis. Join TravelQuest in October 2017 as we weave together all of this and much more on a one-of-a-kind journey to Norway. From pristine landscapes of extraordinary beauty to the proud legacy of Nordic history and culture – plus eight nights of excellent opportunities to witness the elusive northern lights – this Scandinavian adventure promises to create a lifetime of memories. We journey by rail to Flåm and Voss through some of Norway’s most magnificent landscapes. Setting out from the west coast port of Bergen, enjoy six nights of cruising Norway’s magnificent fjords aboard a vessel of the celebrated Hurtigruten line. 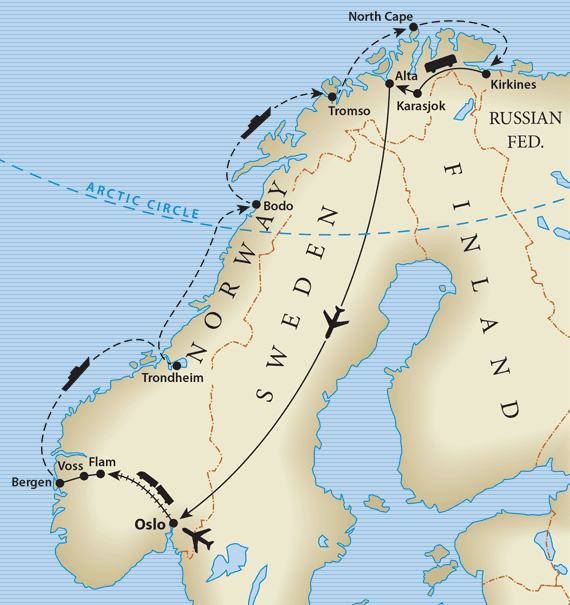 You sail up the coast to Nordkapp (North Cape), the most northerly point in continental Europe, then carry on to Kirkenes near the Norway-Russia border. Next you’re immersed in the indigenous culture of the Scandinavian Arctic as we use remote Karasjok as a base for exploring the Sami way of life, past and present. And after days spent viewing reindeer on the tundra, followed by evenings of feasting, songs and storytelling with our Sami hosts, you have the ideal vantage point for taking in the dramatic lightshow overhead. To make the most of your northern journey, you can opt to extend your stay in Oslo, Norway’s elegant capital, with its impressive architectural monuments and sophisticated, welcoming people.